Provinces of the Eastern Han Dynasty in 189 CE. Liang Province or Liangzhou (涼州) was a province in the northwest of ancient China, in the approximate location of the modern-day province of Gansu. It was bordered in the east by Sili Province. Map of the Han–Xiongnu War. The province was first conquered by the Han Chinese in the 120s BCE during the Han–Xiongnu War, and settled in the decades thereafter. The Hexi Corridor served to connect China proper with the Western Regions, which helped secure important parts of the Silk Road into Central Asia. In 107 CE, the Xianlian Qiang rebelled against Han authority. After heavy fighting, and proposals to abandon Liang Province, this First Great Qiang Rebellion was quelled in 118. Efforts were made to resettle the province from 129 to 144, although large parts of Liang remained without effective government. General Duan Jiong conducted another successful campaign against Qiang rebels in 167–169, committing a massacre at Shoot-Tiger Valley. In 184, concurrent with the outbreak of the Yellow Turban Rebellion in large parts of China, the Liang Province rebellion commenced. 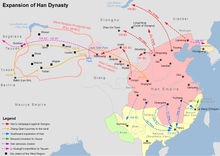 Han campaigns to retake the area remained inconclusive, and by 189 Liangzhou was a de facto independent warlord state ruled by Han Sui and Ma Teng. Warlord Cao Cao started an offensive against Liang Province in 211, winning a key victory in the Battle of Tong Pass (211), and finally conquering the entire province in 215. ^ a b de Crespigny, Rafe (2016). Fire over Luoyang: A History of the Later Han Dynasty 23-220 AD. Leiden: Brill. p. 26. ISBN 9789004325203. Retrieved 28 April 2018. ^ de Crespigny, p. 10–11. ^ de Crespigny, p. 11–12. ^ de Crespigny, p. 13. ^ de Crespigny, p. 14. This page was last edited on 22 May 2018, at 02:48 (UTC).